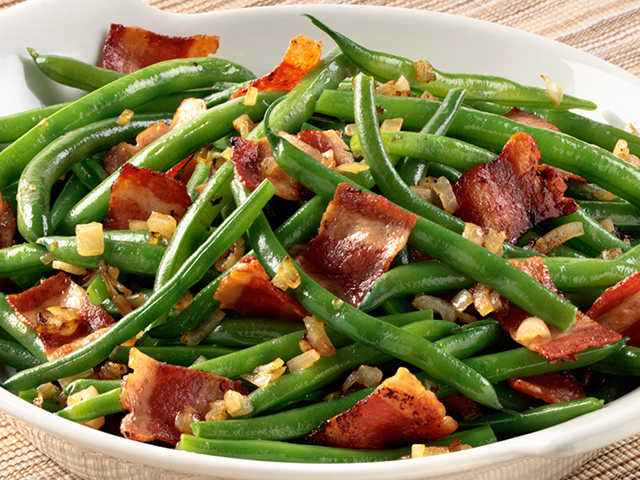 Chopped shallots are skillet-sautéed in butter and added to this tasty green bean salad with savory pieces of turkey bacon. Cook bacon in large skillet on medium-high heat 5 min. or until lightly browned, stirring occasionally. Remove from skillet; set aside. Add butter to skillet; cook on medium heat until melted. Stir in shallots; cook and stir 2 to 3 min. or until lightly browned, stirring occasionally. Stir in beans and bacon; cook 2 to 3 min. until heated through, stirring frequently. A member of the onion family, shallots are available year around. Choose dry-skinned, plump and firm shallots with no signs of sprouting. If you don't have shallots, you can use onions instead.